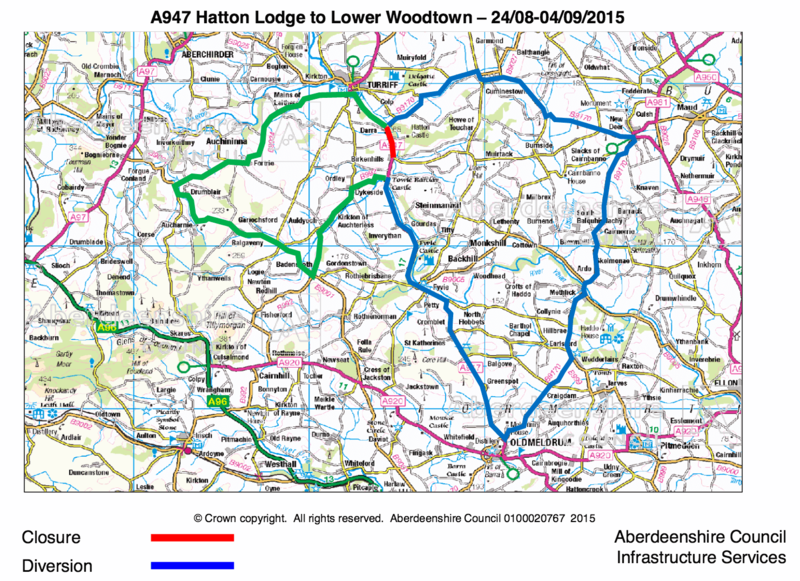 Aberdeenshire Council are warning that the A947 is going to be closed between 9am & 4pm Monday to Friday for two weeks from 24 August for major resurfacing works to be carried out. A 500 metre stretch of road, between Hatton Lodge and Lower Woodtown, south of Turriff, is to be resurfaced at a cost of approximately £125,000. Pedestrian access will be maintained in all cases, as will vehicle access to affected properties where possible. The A947 resurfacing works have been planned for some time and scheduled to take place during off-peak hours, when traffic volumes are lower, to minimise disruption. Aberdeenshire Council apologises for any inconvenience caused during the works, but hopes that the public will appreciate that these repairs and improvements are essential and that the benefits will outweigh any disruption that occurs.